FILE - A supporter of Ugandan pop star-turned-lawmaker Bobi Wine is arrested by security forces during protests in Kampala, Uganda, Aug. 31, 2018. FILE - Ugandan pop star-turned-lawmaker Bobi Wine attends the National Press Club in Washington, Sept. 6, 2018. "We have received multiple credible reports of excessive use of force by the Special Forces Command (SFC), including abuse of members of parliament, journalists and others," the State Department official said in a statement. "The United States has made clear to the Ugandan government that such human rights abuses are unacceptable." Ugandan President Yoweri Museveni, in power since 1986, on Sunday warned against foreign interference in Uganda's politics. FILE - Uganda's President Yoweri Museveni attends his inauguration ceremony in the capital Kampala, May 12, 2017. The State Department official said the U.S. embassy in Kampala had not worked with Uganda's Special Forces Command (SFC) since early 2016 because of human rights concerns. 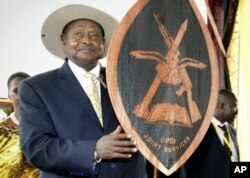 The U.S. relationship with Uganda was aimed at promoting stability and security in the region, the official added. "It is now up to the Ugandan government to demonstrate a respect for its constitution and its citizens and conduct a transparent, credible and timely investigation into these events," the official said. "Any security personnel found to have used inappropriate force must be held accountable." Kyagulanyi has gained popularity for his attacks on Museveni. He was charged with treason last month over the suspected stoning of Museveni's convoy in Arua. He denies the charge and says he was tortured in detention. He arrived in the United States last week for treatment for his injuries. 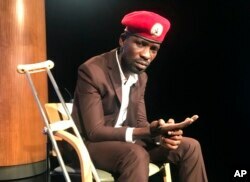 Representatives from the State Department met with Kyagulanyi on Thursday "as they have done in the past when he visited the United States," according to an official.